Featuring a shiny new 1.5GHz dual-core Qualcomm Snapdragon S3 processor, we’re naturally inclined to see how the HTC Amaze 4G is able to handle right out the box – especially for something that’s considered to be amazing!, Well, there’s no question about it, but the Samsung Galaxy S II has shattered our perception on what kind of benchmark scores are regarded as mind blowing. Still, we’re confident that the HTC Amaze 4G will be able to stand its ground. Beautified with the visual eye-candy experience of Sense 3.0 running on top of Android 2.3.4 Gingerbread, we’re digging the responsiveness of the handset from the onset – in fact, it’s able accomplish most tasks without breaking a sweat. Though, its fluid movement while navigating across the homescreen is reduced when graphically intensive live wallpapers are used. Nevertheless, it’s nothing eye straining enough to cause us to scoff at it in a vehement tone. 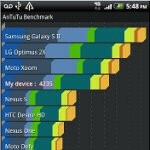 Turning our attention over to Quadrant, the HTC Amaze 4G is able to pull up scores ranging between 2,228 and 2,658, which are nothing too commanding versus the competition – especially when we’ve been jaded to what we’ve seen obtained by the Samsung Galaxy S II. 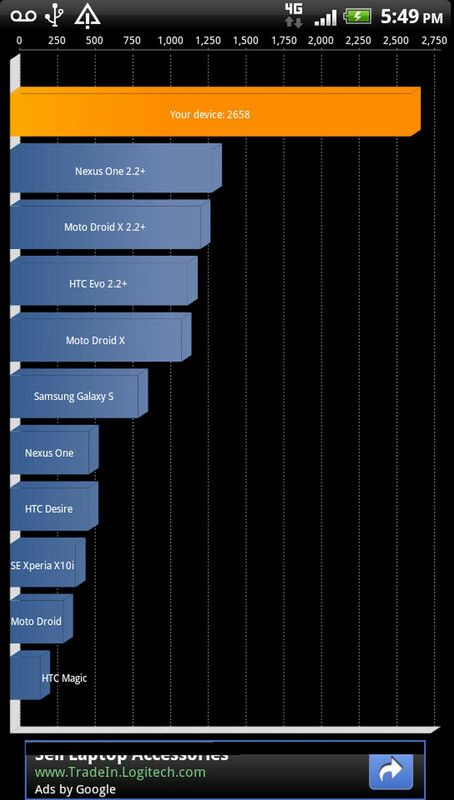 On the other hand, the AnTutu benchmark test gave the handset an overall score of 4,235. Granted it’s decent, the result is actually behind the heavy movers in the landscape. Generally, we really need to take benchmark tests with a grain of salt, mainly because there are multiple factors that come into play that can skew the results. Above all, we’re most concerned about the handset’s actual real world performance, and by quickly gauging what we’ve seen in the short time, its shiny new processor seems to do justice – well, for now that is. so.... samsung must have did something to get scores of +3000 on the tmobile version of the galaxy s2 because it doesn't make sense how this only gets 2300 while they both use the same cpu?? 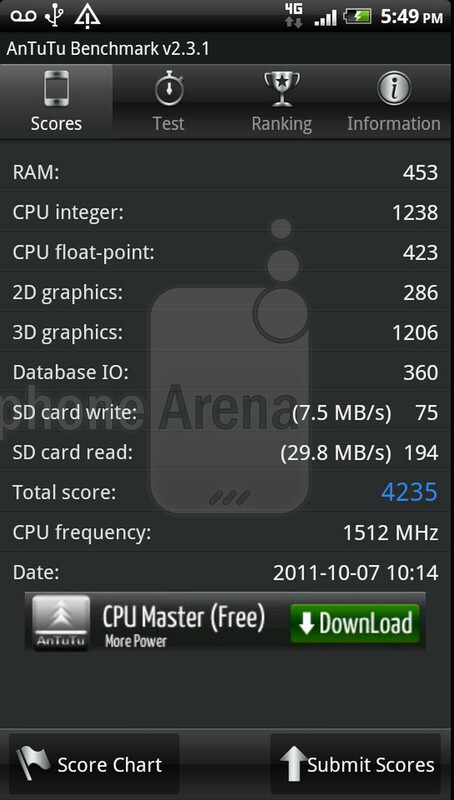 To some it up the sgs2 benchmarks are a lie!!!!! you pinned the nail on the head when you said "sense". Maybe Samsung phones have faster ram modules, which could reason for higher scores in benchmark tests. Its true what you said, but its cause of sense. Sense is an awesome UI, but it takes its toll on the overall performance. But still think the scores are too low. Although this is clocked at 1.5ghz, you see phones like the Atrix clocked at 1ghz and get surpringly much higher results on both. 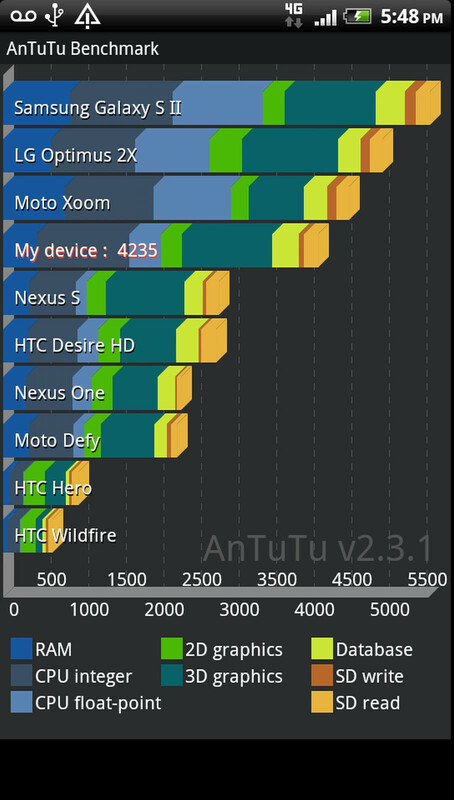 on Benchmark it gets between 2500 and 2800, with higher results on rare ocasion, while on Antutu it gets anywhere from 4,500 to 4900. But i think its still a good phone sense makes things look so beatiful. My sweet GS2 is still under command...!!!!! Well well. First of all thats benchmark need to be upgraded first to test the power whitout using the UI. Why? well i found out on my htc desire hd thats the ui is turned off when in-game so basicaly in real world usage the Sense is not really a problem. Then as some other said the benchmark is not made to take into account the new asynchronous cores management. Another thing is the résolutions i found out also thats higher resolution phone will get lower test score. 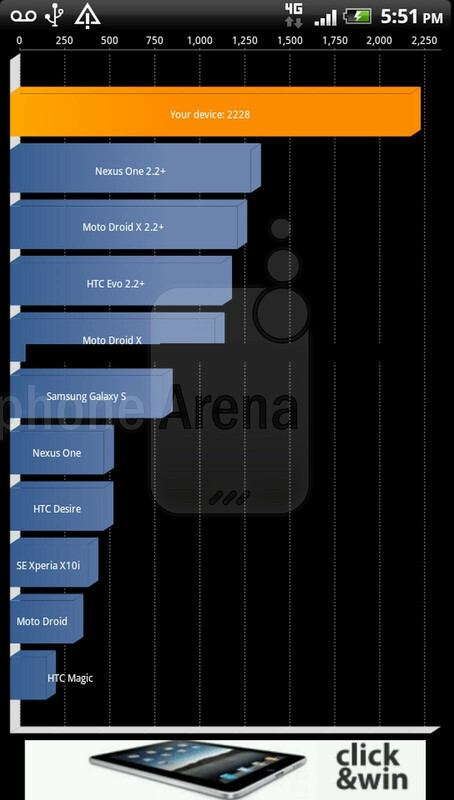 So overall Quadrant is not a good benchmark lol.